This open 7400 competition entry is a clock which displays it’s time as text on 32 5×7 dot matrix displays. 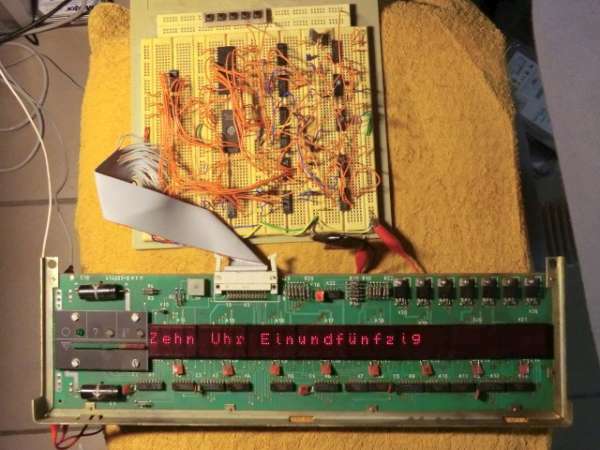 The display itself is driven via a board that was scavenged from an East-German numerical control unit. I build this clock with an old display-board from an east-german numeric control. It has a one-line display with 32 5×7-dot matrix displays (old VQC10 from the GDR). The clock shows the time as a text. The circuit on the breadboard is made out of 14 74HCxx chips and two EPROMS. This entry was posted on Friday, November 2nd, 2012 at 5:00 am	and is filed under 7400 contest, contest. You can follow any responses to this entry through the RSS 2.0 feed. You can skip to the end and leave a response. Pinging is currently not allowed.